Namel Weeramuni sat on the stage of his own theatre like a Roman statesman in a forum of antiquity. His audience comprised of so many personalities. The keynote address which was delivered by his friend Prof. Wimal Dissanayake was very analytical almost like those debates held in a Roman Forum. The only thing lacking was a toga on Namel Weeramuni. And in essence it was a debate, with some in the audience questioning Dissanayake's perspectives. Prof. Dissanayake is a leading international Authority on Asian Cinema and Asian Communication theory. "He [Namel] was a dynamic organizer of literary events when we were undergraduates at Peradeniya, inviting distinguished writers to our writers circle and discuss their literary work . We were seriously in literature with all our intentions." stated Dissanayake. "He deals with a number of themes both personal and social and one central theme that dominates the other themes is freedom. Now freedom is a concept fraught with difficulties but at the same time it is also a concept with which we should grapple. Jean Paul Sartre the French philosopher said that we are condemned to be free. Because then we have no excuse. We cannot say God is responsible or the social structure is responsible. We have to take responsibilities for our own actions. Freedom carries with it a heavy burden of responsibilities." explained Dissanayake. Dissanyake also said that it was this type of anxiety present in Weeramuni. He is trying to come to grips with the problematic nature of freedom. "But his interest in freedom also manifests itself in the way he uses the English language. He [Weeramuni] feels that we have the freedom to use the English language in way that captures our own sense of sensibility. That freedom is something he cherishes. The idea of freedom is quite central to understand what he is seeking to do" added Dissanayake. 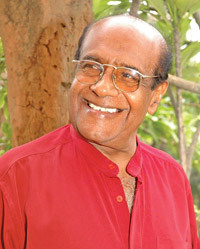 Dissanayake went on to say that the title 'Damsel of Death' points to the fact that Namel Weeramuni has an interest in psychological themes as well. He, Prof. Dissanayake, even went on to say that death and love become interchangeable, one taking the role of the other. Last but not least is the man Weeramuni. He is a lawyer by profession having practiced law in London for 29 years. Weeramuni is a dramatist, a short story writer, poet and playwright. Further elaborating Weeramuni said that they are actually very personal and emotional. They mostly talk of loneliness, sometimes about feelings of others, social political and so on.